Synopsis from Goodreads: Lola Nolan is a budding costume designer, and for her, the more outrageous, sparkly, and fun the outfit, the better. And everything is pretty perfect in her life (right down to her hot rocker boyfriend) until the Bell twins, Calliope and Cricket, return to the negihborhood. When Cricket, a gifted inventor, steps out from his twin sister’s shadow and back into Lola’s life, she must finally reconcile a lifetime of feelings for the boy next door. I loved Lola even better than its predecessor, Anna and the French Kiss. There were some great messages about life in it – not just a sweep-me-away romance, though there was plenty of that too. Lola was an amazingly unique character, without having “special snowflake” syndrome, and Cricket has quickly become a new favorite character out of any book that I’ve ever read. The story had that fluffy sweetness like Anna, but there was just something special about Lola that takes it a step ahead. This is one of those books that you just want to hug because it’s so perfect – a must read for sure! I’ve got it – bubble heart. I could seriously float away right now, and it’s been a month since I’ve read this book. There’s just something so magical that I get these warm fuzzies in my chest because it’s that good. You all know how much I adored Anna and the French Kiss – Lola blows that out of the water and has completely taken up residence as new favorite book from Perkins. 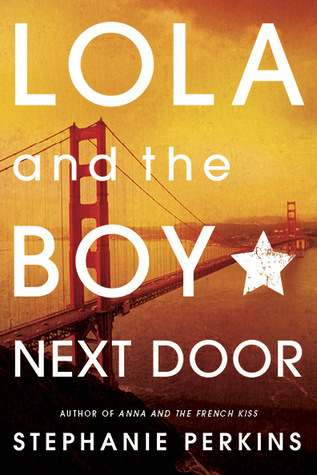 Isla and the Happily Ever After is going to have to be like… flawless, to even come close to the magnificence that is Lola and the Boy Next Door. The characters were amazing – and they weren’t perfect, which is what makes them perfect. Lola is a fish out of water, with a weird fashion sense and the screwy idea that she can date a guy four years her senior without any negative consequences. Her dads were awesome, and actually acted like parents! (So, sorry to my post yesterday – there’s one YA family that isn’t dysfunctional) Then there’s Cricket Bell. Dear Lord almighty Cricket Bell. I’ll keep it to one sentence because I don’t trust myself with more. Okay – two. Cricket is the most amazing, nerdy, geeky, intelligent, funny, a-typical-male, insert-a-million-positive-adjectives-here person I’ve read: he beats Matt from Flat Out Love for sure. Etienne St. Clair might be a charmer, but Cricket is the one you want to settle down with for eternity. Or, I want to settle down with for eternity. You can’t have him. The story was great too – Lola had a lot of self-discovery and maturation to do, and the romance with Cricket almost took a backseat for a while. And there was a really positive message about relationships – if they’re toxic, don’t stick around! Get yourself out of there, and face life head on instead of running away. I also love how Perkins brought back Anna and Etienne – it took me a second to figure out that it was “the” Anna; I didn’t put it together till she mentioned Etienne! So I’ll stop rambling now, but here’s one last thing: read the book. It’s a fluffy romance, but it isn’t cheesy or sickly-sweet. It can brighten the worst day, and it’s like a friend that says, “come here darling, everything will be all right.” Yes, my books talk to me. The question is: why don’t yours? PS: Sorry this isn’t a full scope of the book. I tried but I can’t find the right words to do this story justice. I agree with all of this:) I liked Anna a bit better than Lola but still, they’re both so good and it only leaves my expectations that much higher for Isla. Second of all, I really want to read this series. I feel like I’m missing out on all of this awesomeness that seems to be Stephanie Perkins and I am over the moon that you gushed so hard about this! Fabulous review, chica! Staking your claim on Cricket, I see. Don’t worry. As much as I love Cricket, I’m still on Team Etienne. I guess that’s why I love the AatFK better. I do like how this book is so different in terms of characters and family situations. Now look what you’ve done. You just made me want to re-read it! I think I may pick this up soon. I read Anna and the French Kiss months ago and I didn’t like it that much so I’ve been putting off reading this one. But your review has made me want to read it.